GW said the KP had failed to break the links between diamonds and human rights abuses and agreed with the WDC in its highlighting of the critical need for industry to take steps towards responsible diamond sourcing. It further stated that it remains to be seen whether the WDC’s statements are empty words intended to burnish the sector’s tarnished image, or if they represent a genuine shift towards recognition that the diamond industry must embrace transparent and responsible business conduct. GW said it was particularly notable that in the recent WDC statements the council has committed to leading transparency and business conduct from within its ranks. The organisation stated that the WDC had indicated that “while it awaits action from the KP, the WDC is already conducting reforms of its own, to enable, at the industry-level, the type of progress it is advocating in the KP”. “Calls to reform the beleaguered KP are nothing new. Consumers buying diamonds with a KP certificate who believe the scheme provides assurance their diamond has not funded human rights abuses are labouring under illusions. “Civil society organisations have made overtures to reform the certification scheme for almost a decade now, showing that it is simply not up to the job. It was pretty revealing that the diamond industry itself has finally taken up the same message,” said GW. GW added that, although it was good to see the WDC recognising the weaknesses of the KP, both historical and more contemporary developments strongly suggest that the diamond industry’s energy would be much better spent on reforming its own behaviour. 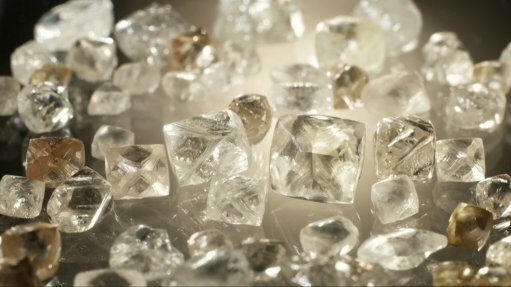 The WDC, meanwhile, commented to Mining Weekly Online that, since it joined the KP at its inception 19 years ago, the council has remained committed to the tripartite coalition of government, civil society and industry, as the most effective instrument for eradicating the trade in diamonds associated with conflict in mining areas. “We recognise the strides that were made after the launch of the KP Certification Scheme in 2003, just as we have been openly critical about the inability, to date, of the KP to address cases of grave and systemic abuse in some countries, which do not occur within the context of civil conflict. The WDC added that, as it continues to advocate for change within the KP, it is also independently addressing those challenges that the KP has not yet taken up, such as through its revised System of Warranties, which reference international standards supporting human rights and strict labour practices, and its ongoing dialogue with the Organisation for Economic Cooperation and Development, “in the context of which we have expressed support for its due diligence guidance for minerals from high-risk areas”. “All the while we remain cognisant that the stakes are extremely high. Millions of ordinary people, the majority of them living in developing economies where rough diamond deposits are located, are reliant on the revenues generated by the industry.